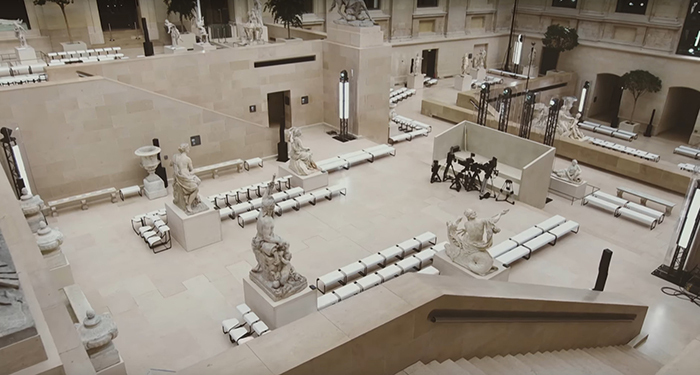 For the March 7 closing show of Paris Fashion Week Fall/Winter 2017, fashion house Louis Vuitton seated guests on hundreds of Toboggan® Benches, Seats, and Chair Desks from Knoll, arranged around the Cour Marly in the Richelieu wing of the historic Musée du Louvre. 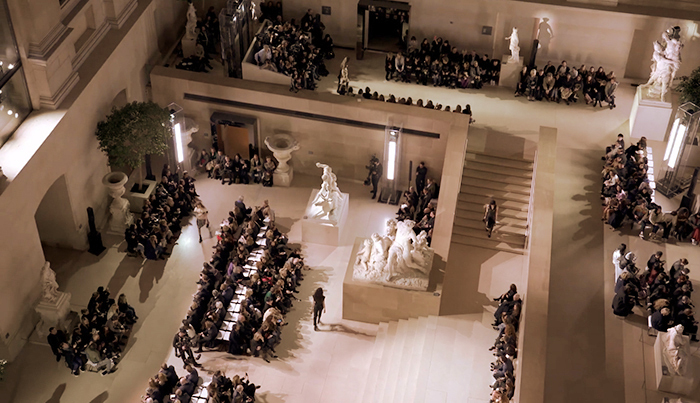 Showcasing looks from creative director Nicolas Ghesquière, models walked up and down the many staircases of the glass-roofed courtyard, weaving between classical statuary and onlooking guests. Along with the avant-garde Louis Vuitton clothing on display, the architectural forms of the Toboggan furniture, all with white seats and black legs, provided a contrasting element of modern design to a space heavily steeped in traditional art. Designed in collaboration with Knoll by Masamichi Udagawa and Sigi Moeslinger of the New York-based firm Antenna Design, the Toboggan® furniture collection represents a playful answer to the needs of the increasingly mobile workplace. Meant to facilitate collaborative working and learning, Toboggan allows users to shift 360 degrees in the seat and engage with the pieces in multiple ways. Its use in the Louis Vuitton show proves the success of its design even when removed from the office. 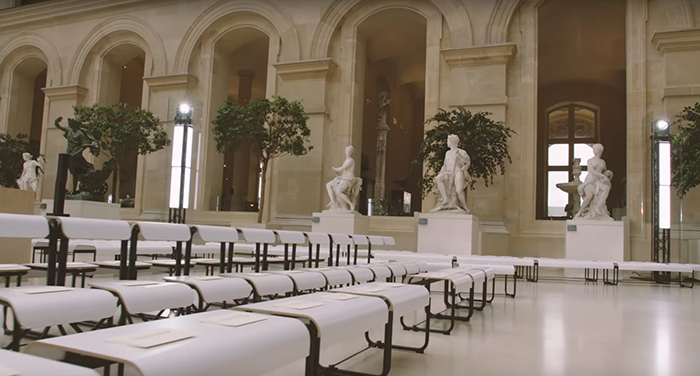 By placing pairs of Toboggan® Chair Desks in mirrored rows, the fashion house was able to create aisles within the massive room, using the seating to form a dynamic route for the runway models. With space underneath the seats, guests could tuck their bags and coats out of sight, maintaining the polished appearance of the entire affair. 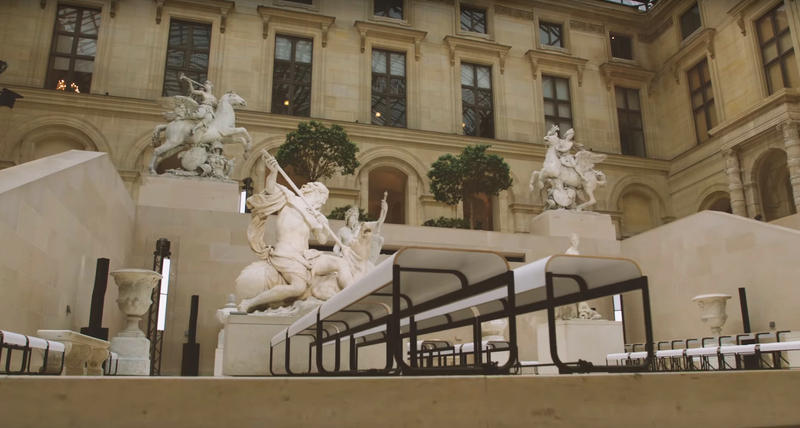 While the Louis Vuitton show marks one of the first fashion shows to be hosted in the Louvre, it is not the first time that Knoll furniture has graced museum’s hallowed halls. In 1972, Knoll was invited to exhibit its modern designs in a critically acclaimed exhibition entitled Knoll Au Louvre, drawing 50,000 visitors to the Pavillon Marson. With a setup matching the flair of the Louis Vuitton show, plexiglass cubes displaying Knoll furniture filled the richly ornamented spaces of the museum, proving that old and new can sometimes exist in brief, spectacular equilibrium.